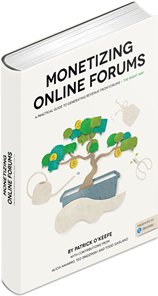 As of April 29, “Monetizing Online Forums,” a guide to monetizing online communities the right way, has been downloaded more than 10,000 times. This is a conservative count that comes from our website and through third parties where the book is distributed. For all of the copies hosted through the website, which make up most of the numbers, we count the downloads in a very conservative way. One IP address can only count as one download of a particular format of a book within a given week. For example, if you go and download the PDF 1,000 times right now, you’ll only count as one download. If you come back next week and download it 1,000 times again, you’ll count as a second download. If you were to download the PDF, ePub and MOBI versions a thousand times each right now, you would count as 3 downloads. If different people download the book, all from the same IP in the same week, they all count as one. While it’s not quite unique downloaders, it’s not too far off. The book was released on July 2 of last year and I authored it with Alicia Navarro, Ted Sindzinski and Todd Garland. We were able to release it for free thanks to Skimlinks’ sponsorship of the project. When we wrote it, one of the overriding principles that I operated under was that I wanted it to be more than a gimmicky free ebook that would only be popular for a few weeks. If this is going to be some short term thing, I don’t want to do it. I believe I told them that I wanted it to live beyond the “retweet cycle.” I wanted it to be something that could help people for years to come. The download numbers show that we have been able to do that. In the first 34 days of the book’s release, it was downloaded 43.5 times per day. In the 268 days since? 26.6. So while there is an obvious and expected drop off after initial announcements, reviews and interest passes, it’s not some sort of massive drop to a trickle. The numbers are steady. People continue to discover and recommend the book because it is as relevant today as the day it was released. I’d like to take a moment to thank everyone who has supported the book. If you have downloaded it, shared it or recommended it, we appreciate it. Thank you to Skimlinks (Alicia Navarro, Joe Stepniewski, Aaron Weissman, Meghan Bender, Barbara Somlai, Ellie Tzoni, Jo Harris and Jurg Schwalb), Ted Sindzinski, Todd Garland, Jason Falls, Sue John, Carol Lynn Rivera, Abby Johnson, Scott Fox, ClickMillionaires.com, Ramona Iftode, TopAdmin.net, Dave Cayem, Grant Griffiths, Jim Kukral, Shawn Collins, Joe Ward, Launch.forum, Brandon Sheley, Admin Talk, Rebecca Newton, e-mint, Jeremy Rogers, phpBBHacks.com, BuySellAds.com, Ning and FeverBee. There are others. Thank you to anyone who has helped bring the book to more people. I really appreciate it.